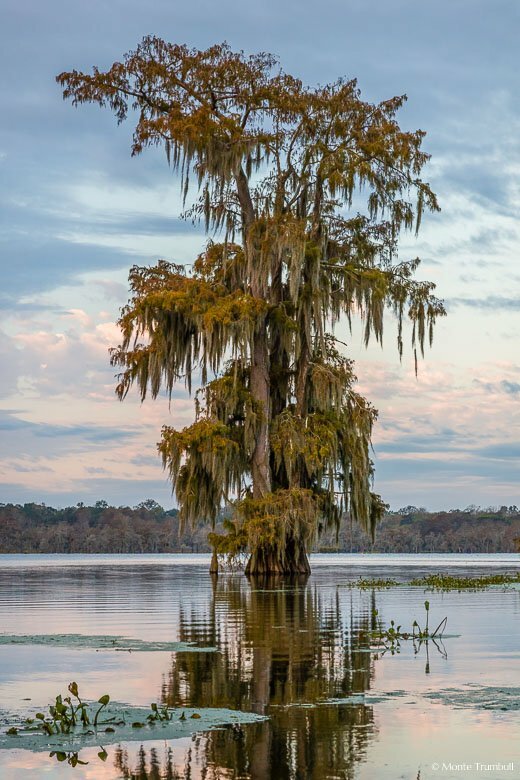 A lone bald cypress tree with rust colored leaves stands shrouded in Spanish moss in the shallow waters of Lake Martin outside Breaux Bridge, Louisiana. I recently returned from a trip down to Louisiana to visit swamps as the bald cypress trees take on their autumn color. The leaves turn a rusty brown before they drop for the winter. I didn’t realize until planning for this trip that that is why they a called “bald” cypress trees. The trip was definitely something out of the ordinary for me. I did most of my shooting from a kayak which was a first for me. The thought of being on the lake with my camera gear was a little discomforting at first, but I did my research in advance and got a good dry bag to work out of while on the water. It didn’t take me long to get the hang of the kayak and I had a lot of fun gliding through the swamp. I took hundreds of pictures every day I was able to get out on the water, so it will take a while to get through them all. This is one of my favorites from this day. It was early morning and the light was just beautiful shining on this tree.